If I had worked with charcoal once in my life before this it was at school and I can’t remember it. 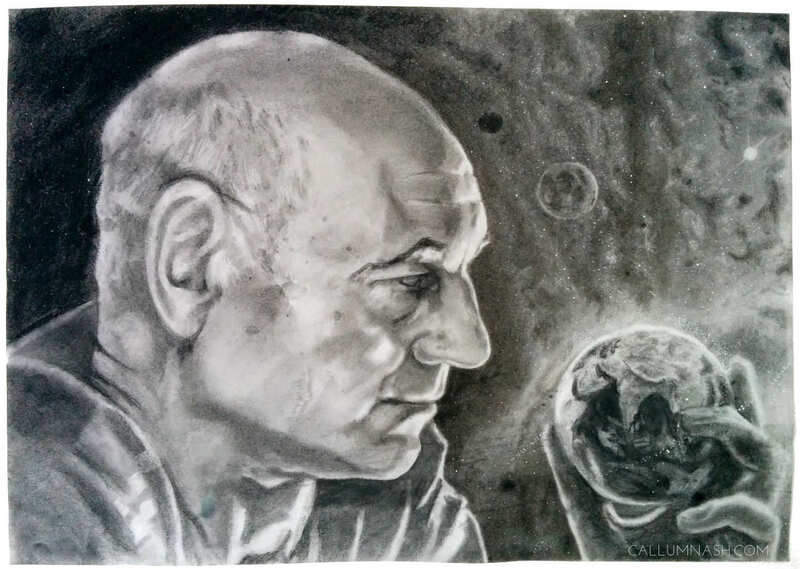 In an experiment to see how far I could push the medium in my first time using it, I decided to work from an image of the illustrious Patrick Stewart, playing ‘Captain Picard.’ The title is a play on words reflecting our shared dependence and destiny aboard the spaceship we call Earth. 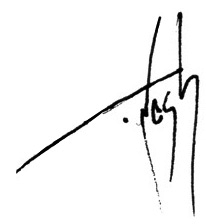 The Sun and Moon are illustrated in their respective journeys, and Earth’s satellite network is visible. Visualised with a mix of infared and visible light. The title is a play on words from the nursery song (which I grew up with) ‘He’s got the whole world in his hands.’ I strongly believe that as a transcended monkey species we all cannot deny our collective shape-shifting of the future, not just environmental but ideological, cultural, technological, and spiritual. Our understanding of science is such that we know that every tiny fractional change in our bodies and minds echoes forward into an infinite myriad shattered mirror of various possible outcomes. As much as one can argue that David Cameron is more important than White Dee, all of us actually change the future with each passing moment, even if you try to sit still for the next thousand years, the particles of that leave your body when you breath will within ten years have spread throughout the entire planet and almost certainly have been breathed by every other human in existence. The particles or radiation that leave your body now will never stop, even when they pass the boundaries of our known universe. So in measurable respects, each of us is infinite, and the consequences of every choice we make (even the choice to read all this lot) echo on way into the future, past even the human race, the space hamster empire and the new romantic energy pigeons. So from a wider perspective, there is no difference between humans other than what we assign and measure as importance, and all of those things — ‘salary’ ‘title’ ‘ownership’ and ‘fame’ — will pass into history and be long forgotten eons before the sun absorbs the spaceship we currently inhabit called earth. So change, true change, is well within our means.